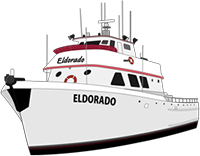 Jeff is live from the Eldorado out of Long Beach Sportfishing with very good fishing again this morning. Plenty of rockfish to go around and 35 lings for the 35 anglers. They are on the hunt for more rockfish to top off the sacks and Jeff will keep us up to date. They have a trip going tonight with just 5 anglers signed up. A couple more make it a go. With trips all month long.